The initial stages of the 2016 Express Trailers Żurrieq Half Marathon, on Sunday. 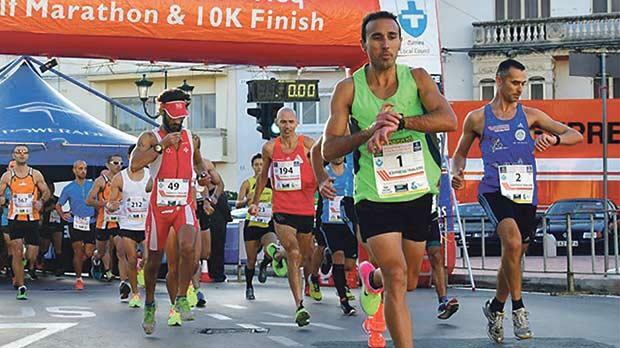 Charlton Debono, of Gozo Athletix AC, confirmed his current excellent form after winning the Express Trailers Żurrieq Half Marathon, last weekend. Debono was first to reach the gantry at the Żurrieq main square, clocking 1:14.00 as Lisa Marie Bezzina, of Athleta Pembroke, won the women’s half marathon in a time of 1:24.50. This year’s 19th edition of the Żurrieq half, 10km run and 10km walk saw another record entry – 1,012 registrations – confirming the event as one of the top fixtures on the local athletics calendar. Debono was more than a minute faster than Jonathan Balzan who led St Patrick’s AC team-mate Matthew Cutajar at the finish line. Balzan was home in 1:15.02 and Cutajar made it in 1:17.39. Josann Attard Pulis, of Starmax, was the runner-up behind Bezzina, in 1:30.34 as Laura E. Heikkila, of AC Libertas, claimed third place in 1:33.45. In the 10km run, Simon Spiteri, of St Patrick’s, placed first after completing the distance in 33:18. He was followed closely by Andrew Grech, of Mellieħa AC, in 33:31, and Gozo Athletix AC’s Stefan Azzopardi (33:43). Rita Galea, of Mellieha AC, won the women’s 10km race in 38:32. She breasted the tape ahead of Angele Satariano (38.44) and Hannah Pace (40.45). Franco Azzopardi, chairman and CEO of Express Trailers, thanked Żurrieq Wolves AC, the Malta Marathon Organising Committee and the Local Council for their efforts to ensure another smooth and efficient running of the races. “These races are now established among the most popular road-running events and at Express Trailers we are proud to be associated with this organisation,” Azzopardi said. “The location, the scenic route that passes through some of the most picturesque villages we have in this area and the very mild weather all contribute to the uniqueness of these races.